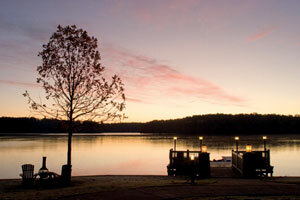 Located on Lake Oconee, approximately 225 miles from Birmingham, The Ritz Carlton Lodge at Reynolds Plantation—with its ambience of turn-of-the-century Craftsman and Adirondack styles—has it all. Situated on 35 picturesque acres, the resort is surrounded by the upscale, 10,000-acre golf and lakefront community, with 99 holes of championship golf, designed by legendary professional golfers. It boasts three outstanding restaurants, an indoor pool, award winning spa, infinity pool and beach, 251 guestrooms, five suites and seven cottages. Our long weekend began with our early arrival on Saturday at noon. We enjoyed lunch in The Ritz-Carlton Club® Level Lounge. Located on the 5th floor with elevator key access, there are 33 Club Level rooms with five suites. And the Club Level Lounge serves breakfast, lunch, light snacks, hors d'oeuvres, and beverages until 10:00 p.m. The ambience is less formal than a restaurant with a dedicated concierge staff to serve. And I am delighted to see a familiar face, Joann Baldwin, whose outstanding and friendly service made us feel at home on our last trip. Our first afternoon is spent by the infinity pool and then off to the lake for a late afternoon private pontoon, dinner picnic boat ride on Lake Oconee. The lake has 300 miles of shoreline and is brimming with large mouth bass, bream, catfish, crappie and striped bass hybrids. It is relaxing to travel with grown sons. But those at the Lodge with kids can relax too with two choices of children’s programs. Ritz Kids Camp is a supervised program offered for five to twelve-year-olds. Camp counselors lead indoor and outdoor activities, including nature hikes, scavenger hunts, canoeing and craft making. The Ritz “Kids Night Out” is available on Friday and Saturday evenings. On Sunday we gather for breakfast in the lounge and go our separate ways. Jordan and Ross are off to the Jack Nicklaus-designed Great Waters Course for a round of golf. 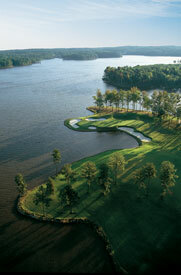 They tee off on the back nine, where every hole is along the shores of Lake Oconee and finish with the front nine. Kevin and I head to the spa’s indoor pool before my spa treatment—Oconee Rain—one of their 90 health and wellness treatments. Performed in the Vichy room, the treatment begins with a lavender dry skin brushing. Next warm lavender-infused stones are placed on key touch points and remain there while receiving a scalp massage. Afterwards a warm rain shower relaxes while cool eucalyptus stones strengthen my energy. The Ritz-Carlton Spa totals 26,000 square feet with 19 private treatment rooms, one couples spa suite, four wet treatment rooms, male and female relaxation areas, indoor lap pool, saunas, steam rooms, whirlpools, relaxation terrace, full-service salon and spa boutique. 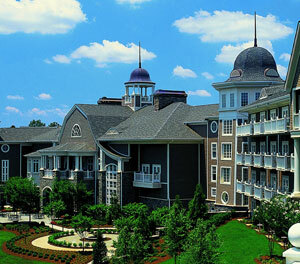 Tonight we dine at Linger Longer Steakhouse—the resort’s classic and upscale American steakhouse. Specializing in seafood and Black Angus Steaks—grilled over 100 percent Georgia hardwood—chef David White sources ingredients from top Georgia and regional farmers and purveyors. Dinner conversation begins with memories of the day’s round of golf. It is delightful to hear about Ross’ dream of playing Great Waters. And they may not have played their best game, but the beauty of the back nine and the day shared in a brothers’ game of golf is etched in their memories forever. The conversation quickly turns culinary when our piping hot starter of Crab Gratin Fondue arrives along with a visit by chef David White. Next a round of Maine Lobster Bisque arrives piping hot and brimming with lobster tail meat in every incredible bite. Entrees of delicate Red Grouper Fillet, an enormous 16 Ounce Kansas City Strip Steak, a succulent Butter Poached Half Main Lobster, and a tender Filet Mignon are paired with sides of golden, fresh creamed Silver Queen Corn and crisp, blue cheese crusted tomatoes. Along with the dessert menus comes a cigar menu and a dessert drinks menu. We share a delicious Valrhona Chocolate Soufflé and a magnificent Grand Marnier White Chocolate Chip Soufflé. If heaven could be tasted, it would be filled with the warm, silky flavors of the Grand Marnier White Chocolate Chip. After dinner we enjoy the rest of the evening under the stars with a spectacular fireworks display. Having taken the day off on Monday, there is no reason to rush home because Club Level guests have a late check out. So we linger longer, spending the day by the infinity pool watching the boats and the day go by.